I don't normally 'do' hotels (it can get a bit tacky) but this walk really starts here. 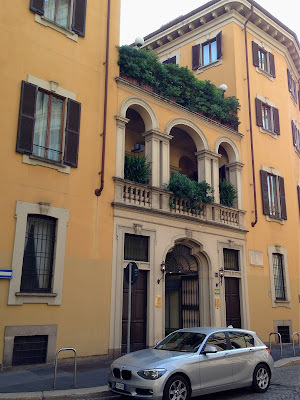 We are on the corner of the (one way) Via Moneta and Via dell'Ambrosiana, and our room (this risks the tacky bit) is on the first floor with the balcony over the loggia, and with all the delights which come with it. The Ambrosiana (Bibliotheca Pinacoteca Accadamia Ambrosiana - more later), as you would imagine, is therefore our immediate neighbour. 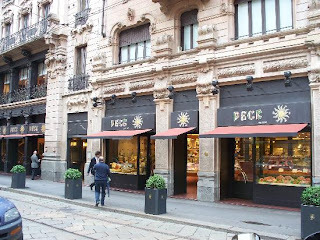 Its main entrance is now from a small but stately piazza, the road closed off, and so we are nestled in this quiet spot passed by only by a few pedestrians and the occasional car and taxi, although it is all really one block from tourist central - the Piazza del Duomo. To get to La Scala, from the Ambrosiana one can walk in a straight line across Via Spadari and the cafe where we would often lunch, as did anyone who could get a table between 1 and 2 when the locals, office workers, bankers, tram drivers too by the look, would crowd in and disappear as quickly as they arrived. That wonderful old foodies' heaven Peck was a few shops along. Crossing Via Spandari you head right into old medieval Milan, the Piazza dei Marcanti, which we walked through countless times, morning, noon, night and very late night, early morning in fact. I never felt afraid, although the doorman at the hotel did hint at the need for caution in the back streets in the wee small hours. In front, stand two columns on what was a pit and the site of a large stone reputedly the 'pietra dei falliti' - the stone of the bankrupts - where punishment took the form of the exposure of the fallen one's bare buttocks for all the see. That's mooning isn't it? Anyway, keep going now, straight ahead. 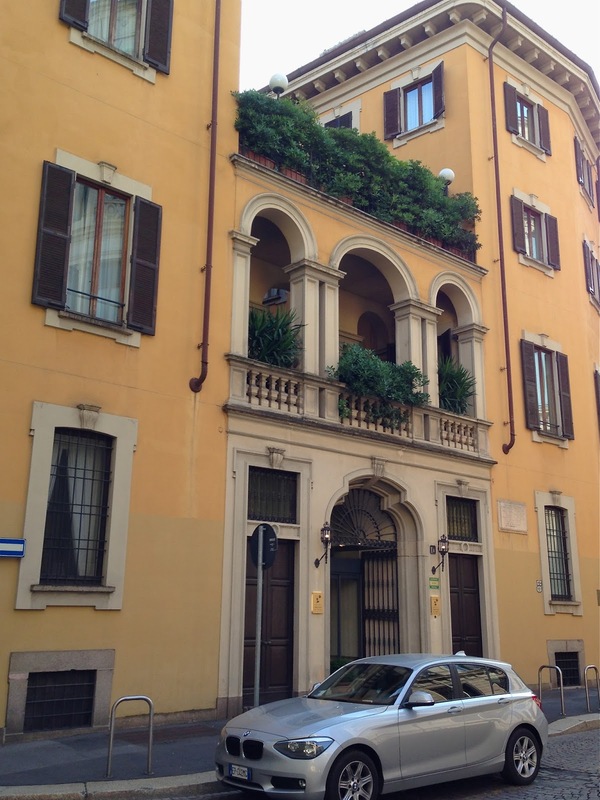 We are now on Via Santa Margherita and in a few minutes there's La Scala, baking in the summer sun. At Scala, Via Santa Margherita becomes Via Manzoni, named after Alessandro Manzoni, the written voice of the the Risogimento. But the night is when Scala assumes its mantle of legend and mystery. We would walk back late, very late, back through the Merchants Square, and linger a little, the night air still warm, the shadows and corners of history impossible to ignore, listening for the babble of the traders, the clank of arms and weapons, the bustle of clothes and voices of the past before heading off again. As I've written to David about other matters, so, too, here, I see better the beauties of Milan through your eyes than I would through my own. Your closing to the post is pure poetry.